In my case I happen to download the iso image “debian-9.3.0-amd64-DVD-1.iso” from https://cdimage.debian.org/debian-cd/9.3.0/amd64/iso-dvd/. Note that I didn’t need the other two ISO image since you can always choose to install additional packages via Internet (if you have good fast broadband). 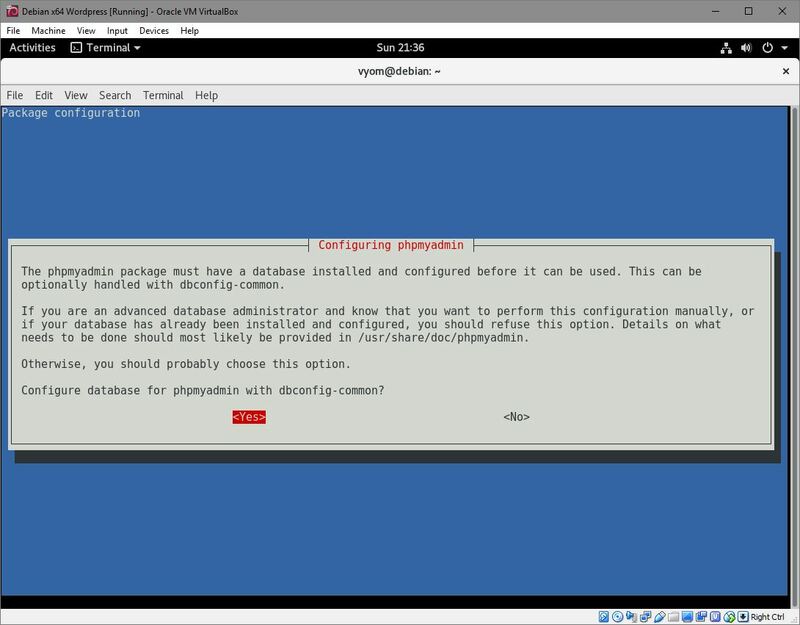 Next thing is to install Debian OS on the virtualbox. This was done by creating a new virtual machine. I made sure to give it 2 GB or memory and 20 GB of space and 2 cores of processor and 64 MB of video memory for speedy and responsive virtual machine performance. You can provide resources depending on how much you want to allocate. I also added an additional IDE drive since it makes it easier to have reference to two different ISO images. 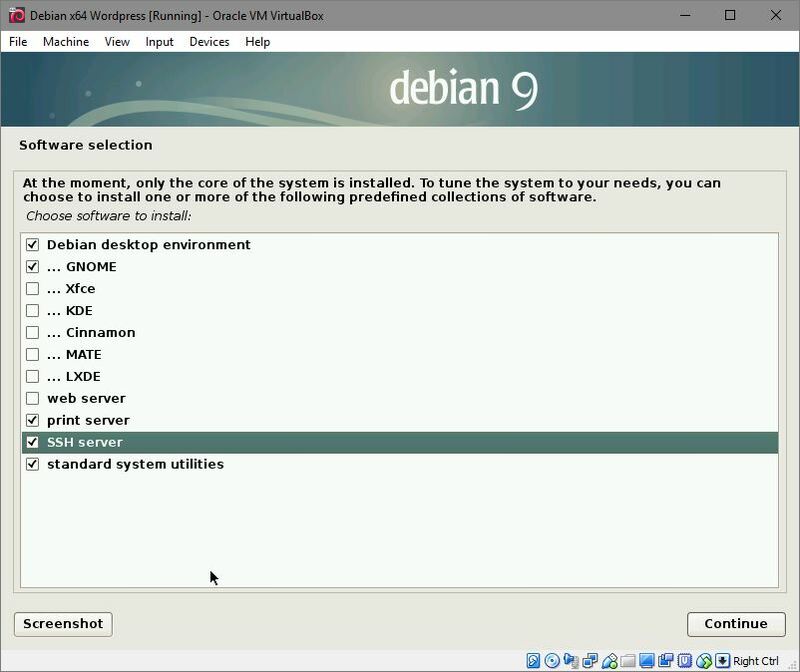 On one of the IDE I gave it the reference of the Debian ISO image we downloaded earlier since we would need it to install debian on the virtual machine. 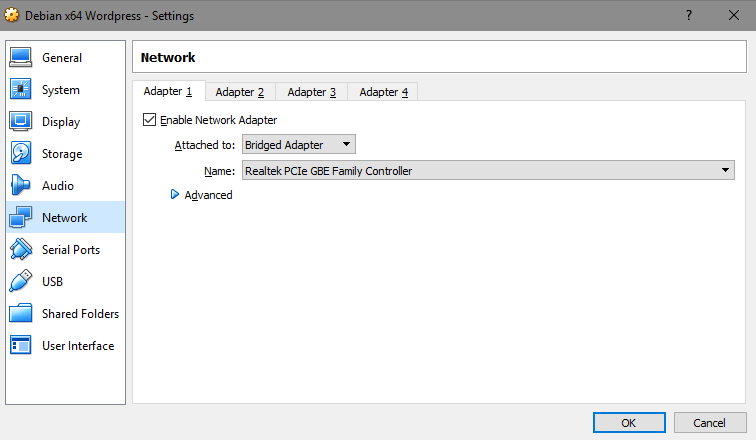 Lastly it’s important to set the network adapter as “Bridged Adapter”. 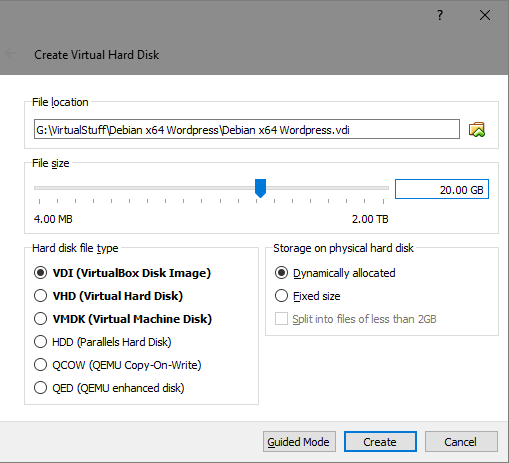 It’s required to have the virtual machine access to Internet while also retaining an IP address that we can use to browse the wordpress site that will be hosted on the debian VM. Now I started the virtual machine and since we had already setup the debian ISO image as primary bootable disk, I was greeted by the installation screen. 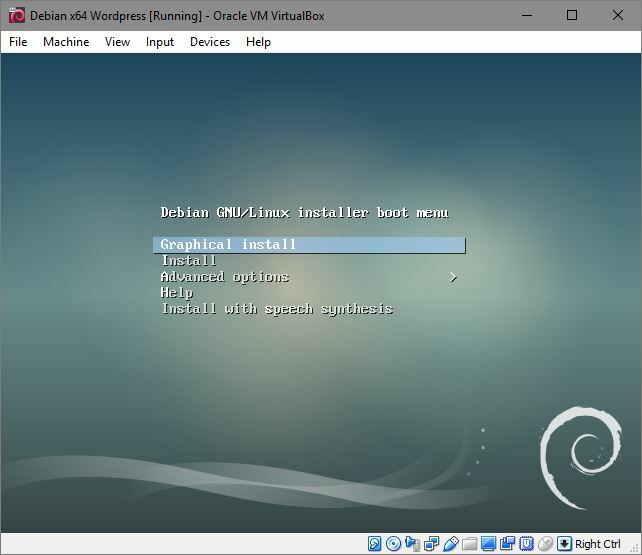 Here I installed the debian like I would on a normal machine. During the installation it would ask for a hostname. Enter something sensible. 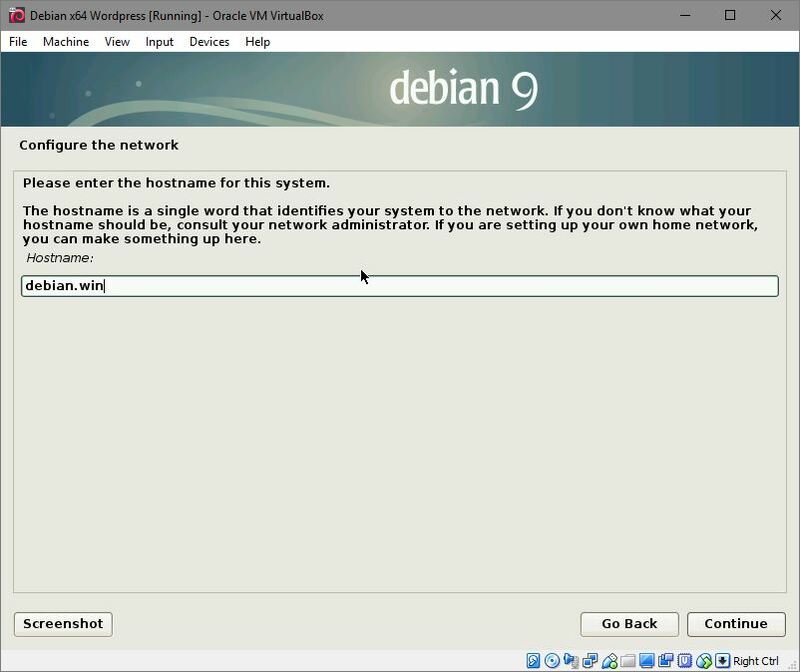 I entered debian.win. 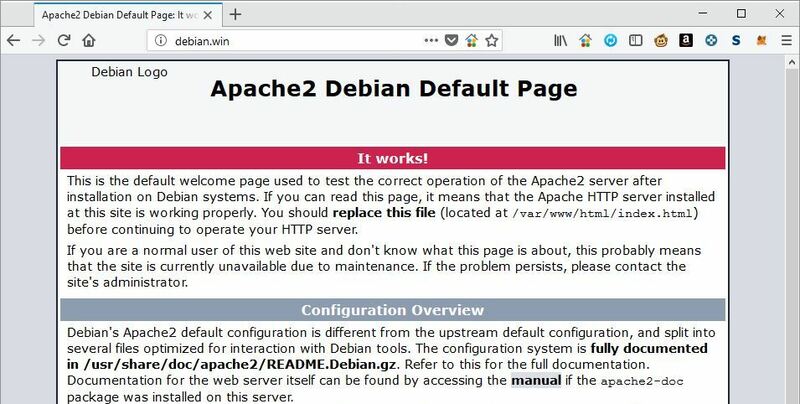 Later we will do something that would let us visit the sites hosted on this VM, using browser from host machine, through this hostname, “debian.win”. After some time the installation also ask to insert 2nd ISO. If you haven’t downloaded the other two ISO images you may skip this step. 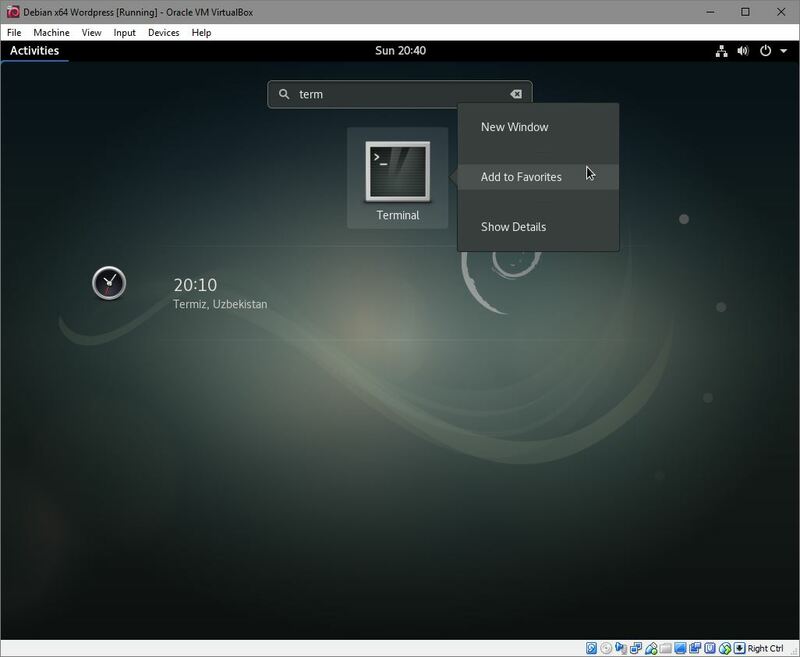 Once the installation reaches a certain step you should also select a desktop environment. 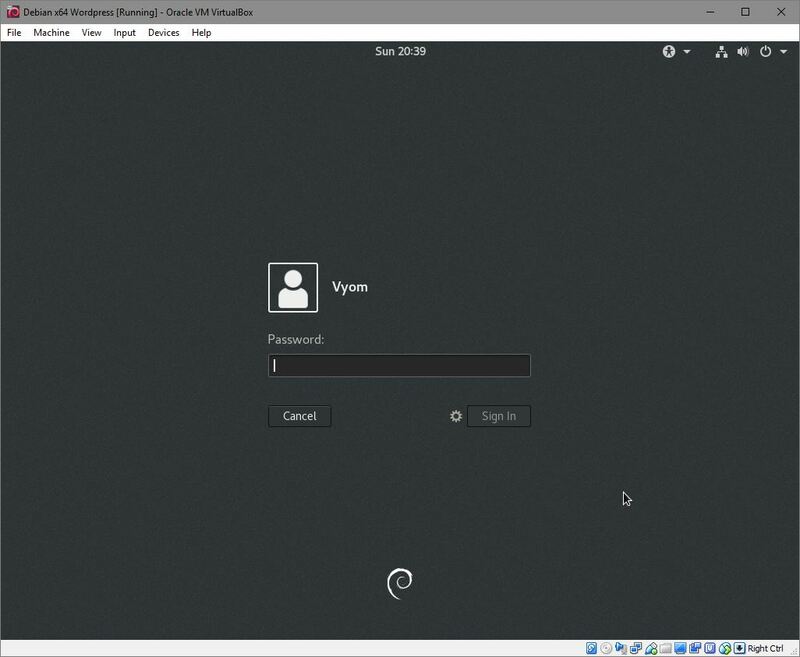 I selected GNOME, since that’s the desktop environment I like. Once the debian desktop is loaded, you might want to add “Terminal” to favorites since we would need to launch it a lot of times. 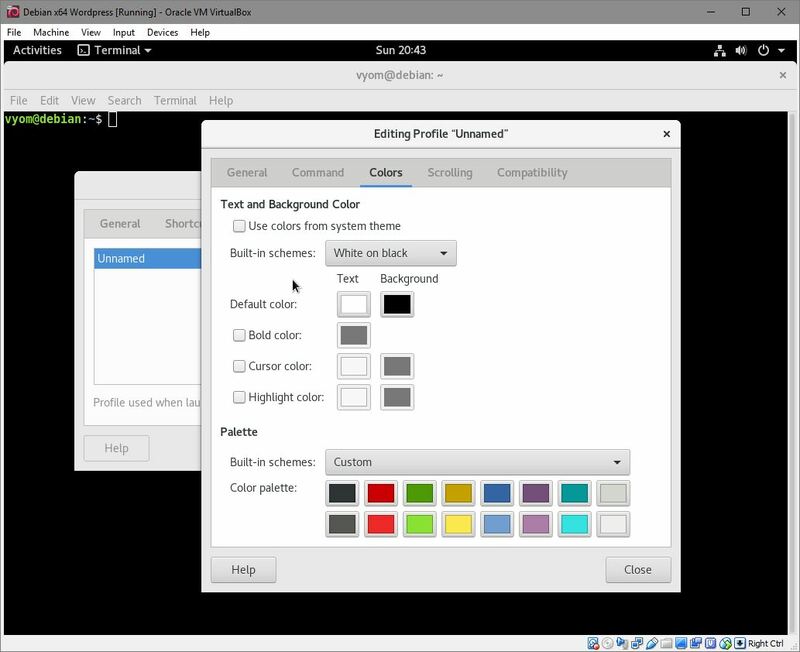 At this point when you launch Terminal, you will be greeted by a black text on white background terminal window. I like to change it to white on black from preferences. I like it that way. I like my terminal colour scheme to be jassy! 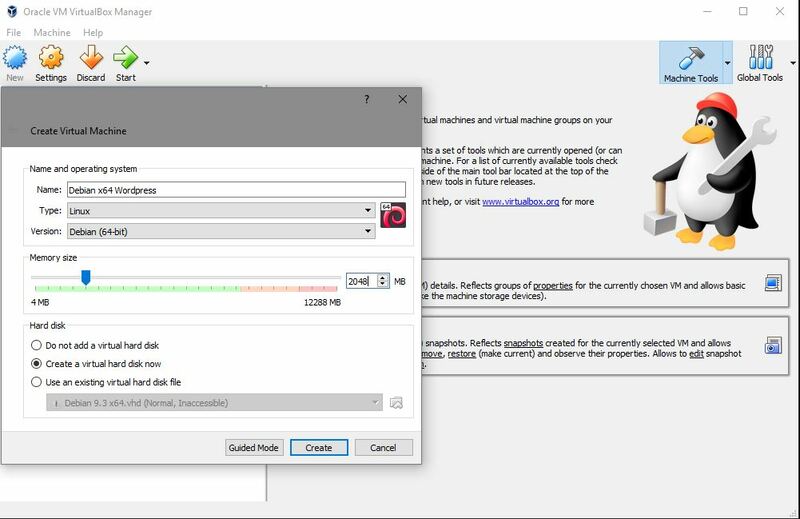 Now, if you notice even if you notice the resolution of the desktop will be limited to 1024 x 768 and you can’t use copy paste text from machine or to your host OS. We would need to do perform certain steps in order for the VM to function optimally. If you get the message “please insert the disc labelled, Debian…” make sure you have the debian ISO loaded on IDE (Devices -> Optical drive -> Debian ISO). Added myself to Sudoer list. Still no love. :/ Wait, you machine, lemme reboot! 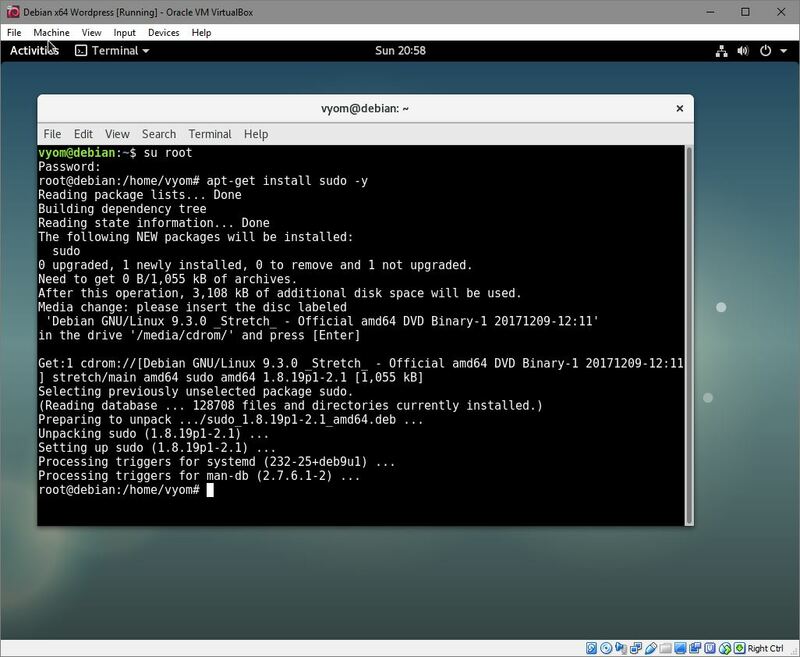 C. Install build essentials: Now that you have SUDO, just run following commands to install build essentials. Above command required 137 MB of space to install and finished in about 15 seconds. Above set of commands requires about 100 MB in total of space and finished in a minute. 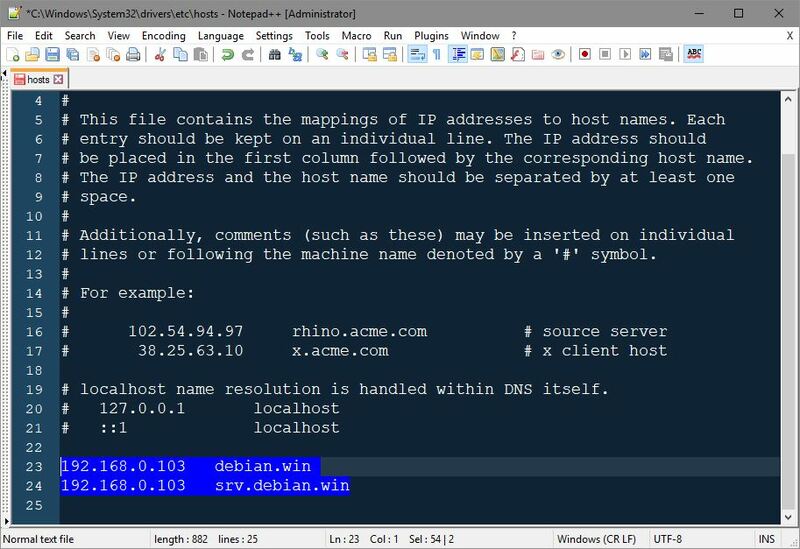 E. Install Virtual guest add-on: Finally we need to install the VM’s guest addon, which you guessed it right we didn’t need to do if this wasn’t a VM. But since it is, just run following command after clicking Devices -> ‘Install Guest Additions CD image’ option. Installing Guest additions. It’s a VM requirement. 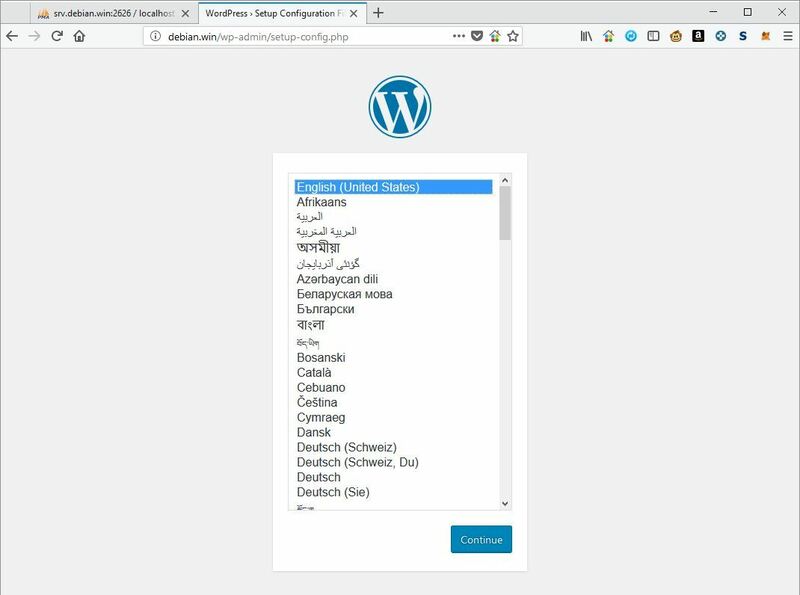 You don’t need to do that if you are setting up wordpress on actual Debian. 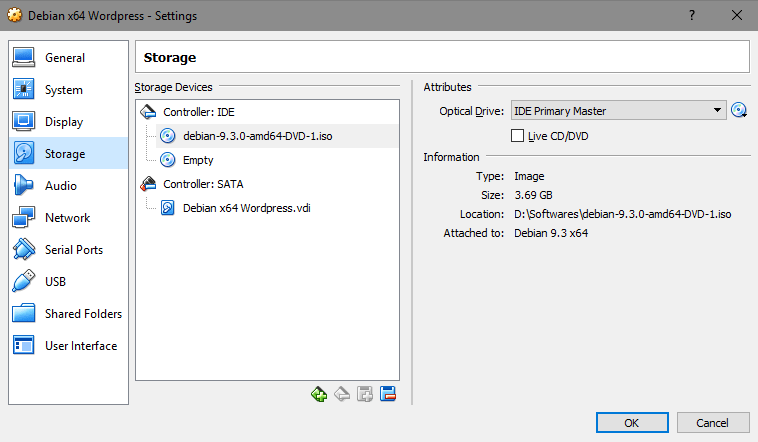 If you are using two IDE drives, then you may need to change cdrom to cdrom1, since if debian’s ISO is attached with first IDE, then the guest additions image would be mounted on second IDE. Once Guest additions are installed, reboot the VM. Once you do that you will notice that more solutions are supported. 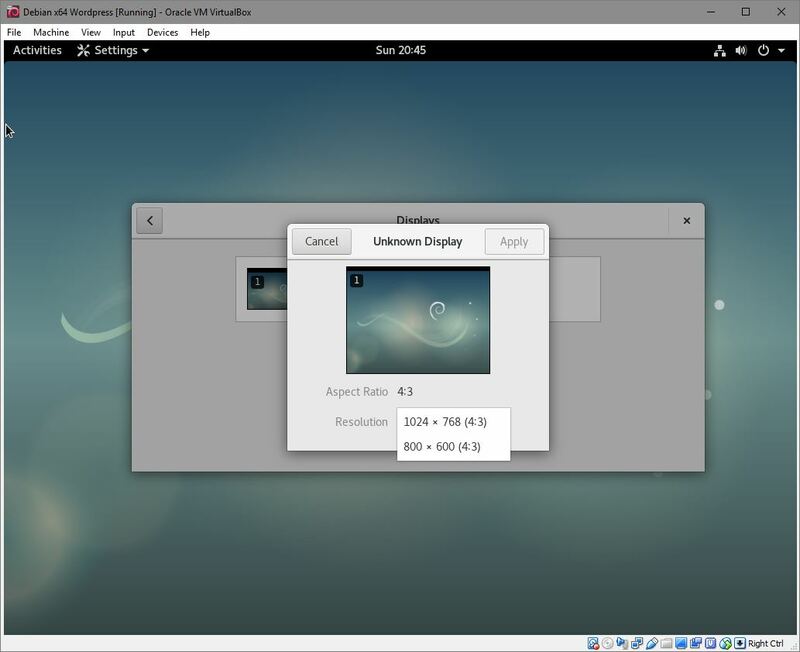 In fact the resolution will change (resize) depending on how large of the VM window you open. Now just select Devices -> Shared clipboard -> Bidirectional, so that you can easily copy paste commands from clipboard. Doing this will let you copy pasta! 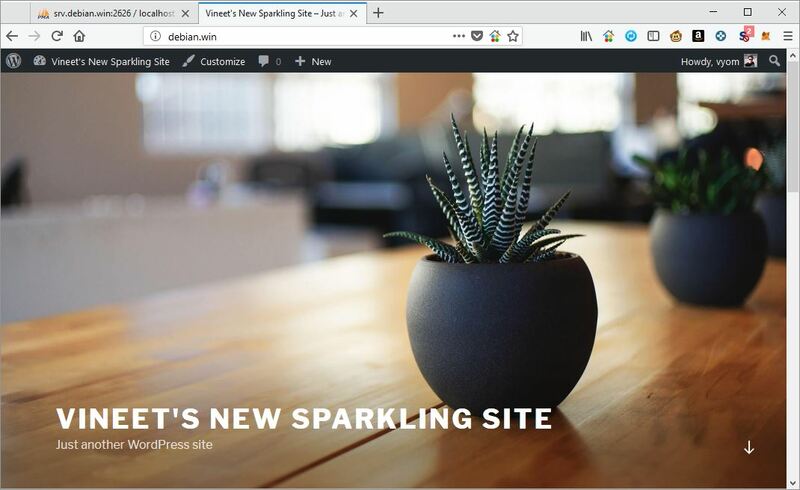 At this point, the VM is ready for us to install next step of LAMP setup, which is installing applications on the debian OS to enable us to host a wordpress website. Select Main, if you get errors. Press Yes. If not you won’t be able to set root password. Not that you need it anyway later. Oh my.. look nginx running smoothly! You know, there’s an easier way to find IP address. Just mouse over the network icon in bottom right of VM. I couldn’t take a screenshot of it, so I choose to find a terminal way for the same. On my VM, it’s IP address was: 192.168.0.103. Yea, you need to run Notepad++ in administrative mode to save changes to this host file. But Notepad++ can also start in admin mode if it requires to. Pretty neat! You need to flush every time, when your job is done. Learning life lessons, from this article. Much better. If you get this, give yourself a pat in the back. sudo !! repeat the previous command which you entered. Pretty good for forcing linux it to work for you. I only wish I can do that for some *non PC related tasks*. 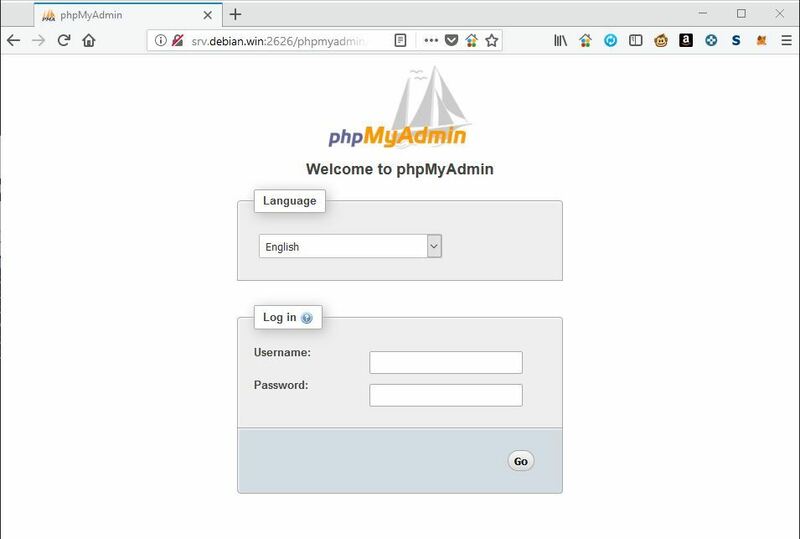 You may be tempted to login to this admin using the root password we entered while installing phpmyadmin, but hold your horses, cause due to some security measure, it won’t allow you to do that. 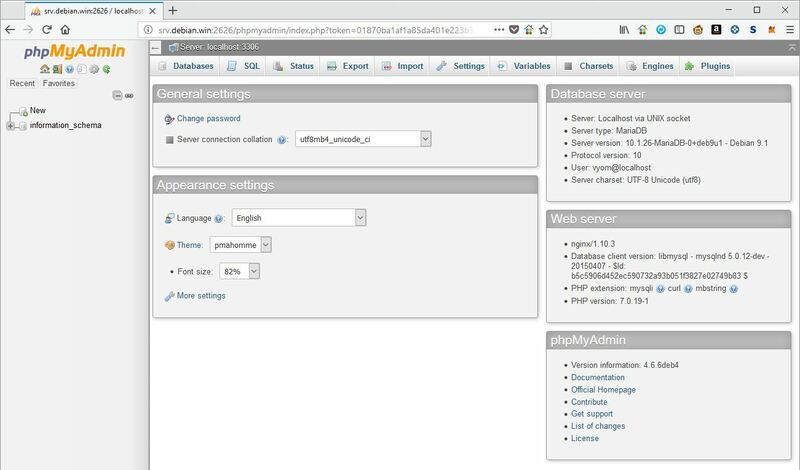 So now we need to create a new mySQL user and use it to access the phpmyadmin. So easy to work on SQL from terminal, innit? 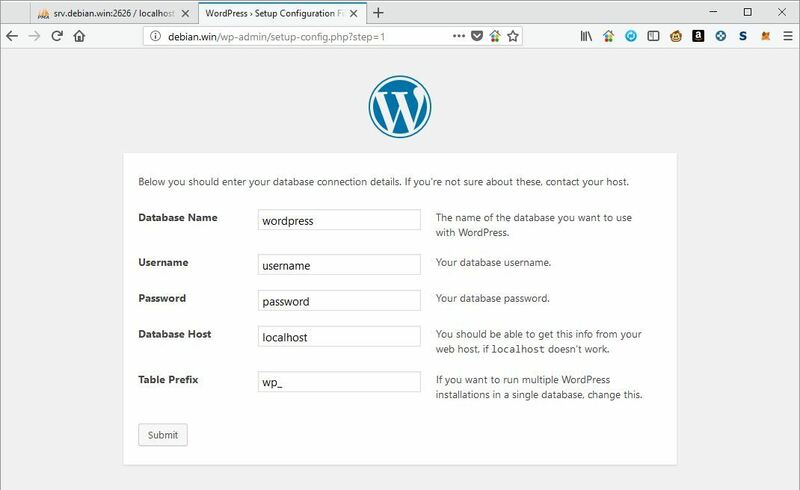 Now on this phpMyAdmin console you can create a database for wordpress, and proceed to install wordpress. phpMyAdmin console. Power of SQL in your hands. Use it responsibly! 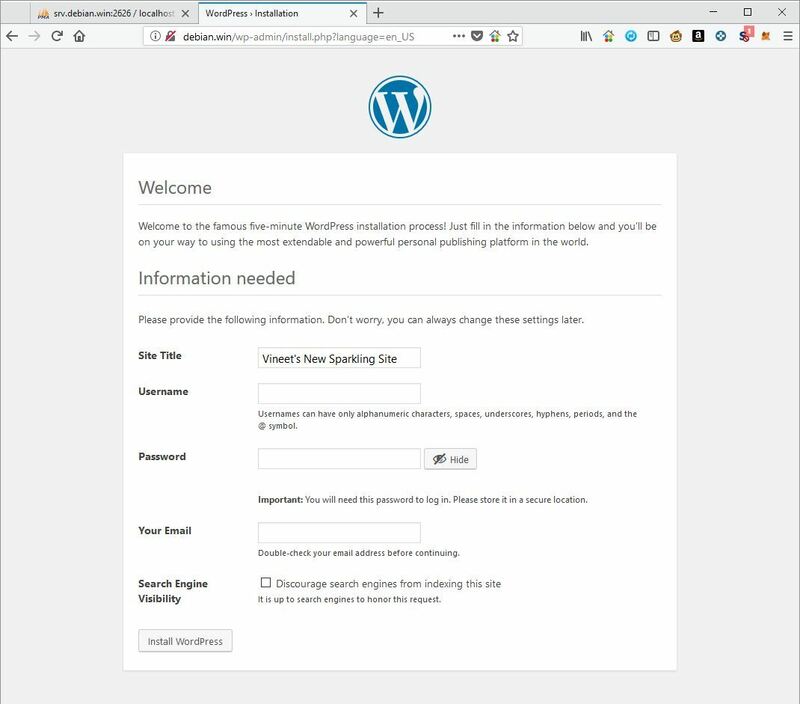 2nd every wordpress settings page. Enter it carefully. 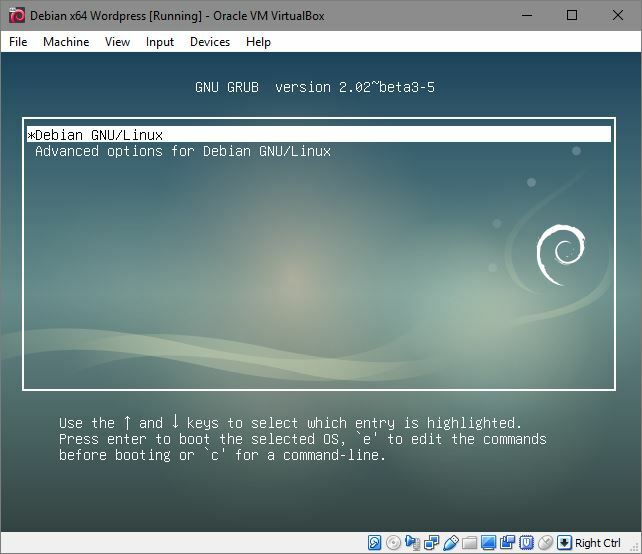 Enter details, and hit “Install WordPress” and viola, you have now configured wordpress on your virual debian machine, and can access it from your host machine!